Customers who purchase a new 2019 special edition Santa Fe 2.2 CRDI DM (RRP$69,990 + orc), will also receive a 2019 Hyundai Accent 1.4 CVT (valued at $28,990). Accent colours are limited and subject to availability. The promotion period: Wednesday 16th January 2019 – Thursday 31st March 2019. Information on the promotion offer form part of these Terms and Conditions. Redeeming this offer is deemed acceptance of these Terms and Conditions. The promoter is Auckland Auto Collection Limited (trading as Manukau Hyundai) (Company Registration # 939375) of 686 Great South Road, Manukau, Auckland 2104. The promotion offer commences in NZ at 8.00am on 16th January 2019 and closes at 5.00pm on 31st March 2019. The promotion offer is available to retail customers, fleet customers, lease companies and small GST registered companies. To redeem the promotional offer, customers must, during the period, specified in clause 3: (a) Purchase a new 2019 special edition Santa Fe 2.2 CRDI DM at full retail price of $69,990 + on road costs (orc) of $1,405. (b) Choose one of the available 2019 Hyundai Accent 1.4 CVT vehicles and pay on road costs of $1,405. (c) Sign an unconditional purchase agreement for both vehicles. (d) Pay a deposit and, if applicable, have finance approved. (e) And then: Make full payment 1 month after securing a deposit. 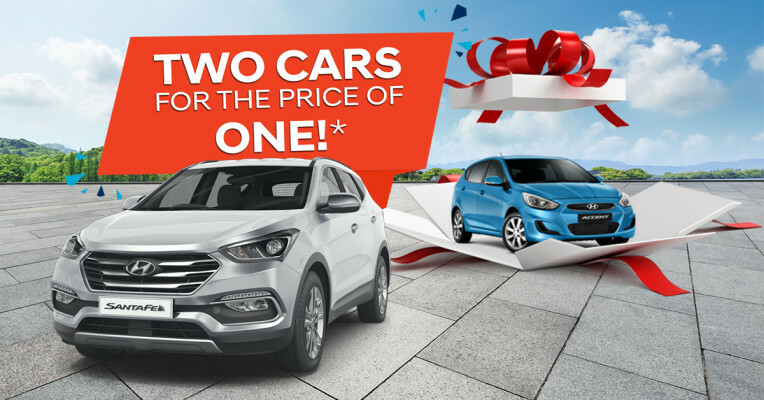 Customers who purchase a new 2019 special edition Santa Fe 2.2 CRDI DM (RRP$69,990 + orc), will receive a free 2019 Hyundai Accent 1.4 CVT valued at $28,990. On road costs for both vehicles are an additional expense. Accent colours are limited and subject to availability. This offer is only available for the first five (5) customers and is not transferrable to any other vehicles. Any ancillary costs associated with redeeming the second vehicle are not included. Manukau Hyundai will make reasonable efforts to ensure that the vehicles purchased during the promotional period are delivered before 5.00pm 28th February 2019, but is not responsible, and accepts no liability, if for any reason delivery does not occur by that date. Only one (1) redemption of the promotion offer is permitted per customer within the promotional period. This offer is not available in conjunction with any other dealership promotion. Redemption of the promotion offer is deemed as approval to use the purchaser’s name(s) and photograph(s) for publicity purposes. Purchasers consent to the Promoter using their name, likeliness, image and/or voice in the event they are a winner (including photograph, film and/or recording of the same) in any media for an unlimited period without remuneration for the purpose of promoting this promotion (including the outcome), and promoting any products and/or services supplied by the promoter. If this promotion is interfered with in any way or is not capable of being conducted as reasonably anticipated due to any reason beyond the reasonable control of the promoter, including but not limited to technical difficulties, unauthorized intervention or fraud, the promoter reserves the right, in its sole discretion, to the fullest extent permitted by law: (a) to disqualify; or (b) subject to any written directions form regulatory authority, to modify, suspend, terminate or cancel the promotion, as appropriate. Nothing in these terms and conditions limits excludes or modifies or purports to limit, exclude or modify the statutory consumer guarantees as provided under the Consumer Guarantees Act, as well as any similar consumer protection laws in New Zealand. Except for any liability that cannot by law be excluded, including non-excludable Guarantees, the promoter (including its respective officers, employees and agents) excludes all liability (including negligence), for any personal injury; or any loss or damage (including loss of opportunity); whether direct, indirect, special or consequential, arising in any way out of: (a) any technical difficulties or equipment malfunction (whether or not under the promoter’s control); (b) any theft, unauthorized access or third party interference; (c) any entry or prize claim that is late, lost, altered, damaged or misdirected (whether or not after their receipt by the promoter) due to any reason beyond the reasonable control of the promoter; (d) any variation in prize value to the stated in these terms and conditions; (e) any tax liability incurred by a winner or entrant; or (f) use of a prize.